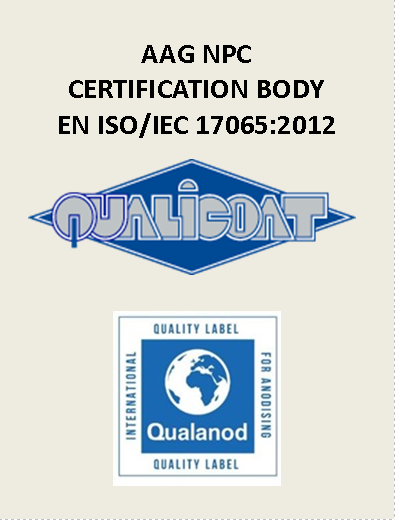 ACCREDITED CERTIFICATION BODY: The Aluminium Association of Greece-NPC, is accredited in accordance with EN 45011by the National Accreditation System as a Certification Body for granting the quality certificates QUALANOD & QUALICOAT. PROCESS & PRODUCT CERTIFICATION: The Aluminum Association of Greece NPC, as a Certification Body for Products and Processes, awards or renews, after inspections the quality certificates QUALICOAT & QUALANOD to aluminium coating and anodizing plants respecgtively. FINAL PRODUCTS WITH TEST CERTIFICATES: The Aluminium systems for doors and windows are certified in accordance with international standards. ALUMINIUM DOORS and WINDOWS WITH CE MARK: Most aluminum fabricators implement the requirements of the EU regulation 305/201 and have the ability to use the CE mark in their products.